Just Romantic Suspense: CHRISTMAS IS COMING, THE GEESE ARE GETTING FAT, AND I’M IN THE MOOD FOR A LITTLE ROMANTIC SUSPENSE! CHRISTMAS IS COMING, THE GEESE ARE GETTING FAT, AND I’M IN THE MOOD FOR A LITTLE ROMANTIC SUSPENSE! Congratulations to GaMom056, the winner in M.J.'s giveaway. Thank you to all who participated! Part of my Christmas tradition has always been to get a Christmas romance about this time of year. I keep it there—hovering in the background—anticipating and savoring the moment (December 1st) when I get to start reading it. 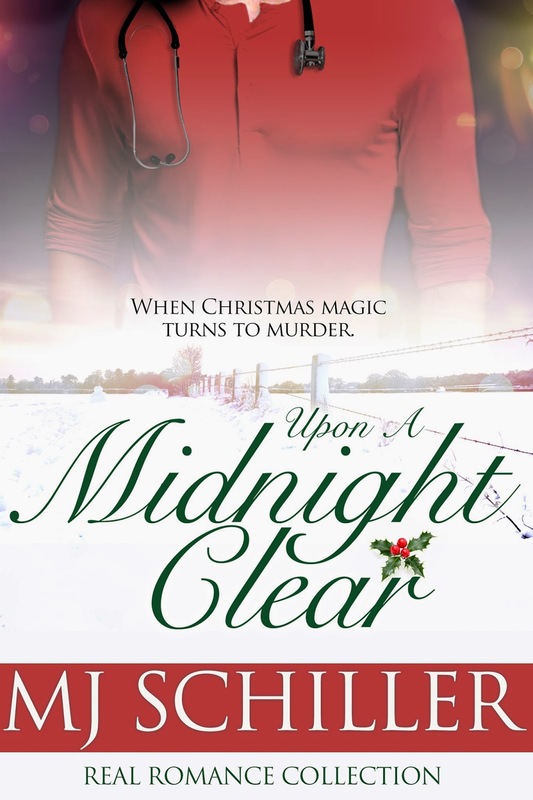 If you are anything like me, I wanted to let you know about my Christmas romantic suspense UPON A MIDNIGHT CLEAR. Dylan Fisher is an EMT and part-time Santa Claus at a mall in Denver, Colorado. He has logged plenty of time with children sitting on his lap asking for anything from the latest electronic gadget to a week’s worth of homework passes, but he never heard anyone ask for what little Delaney Kelly did on one snowy night in December. A dad! When Dylan’s eyes search the crowd for Delaney’s mother and land on Keira Kelly, the paramedic almost finds himself in need of a little CPR. She is stunning! … but a reckless driver has her thinking about nothing but survival as she’s headed home from the mall. When Keira wakes in the hospital to find a hunky EMT at her bedside, she begins having a few thoughts that would put her on Santa’s Naughty List for sure! Neither is ready for what is coming UPON A MIDNIGHT CLEAR! When she finds out the EMT is only hanging around because the police believe someone is out to get her, she’s not sure what to think about his kindness. Is he helping her because he wants to, or because he feels he needs to? And what about the man who rammed her car, could he have had something to do with her husband’s death? Too late, Keira saw the car in front of her making a leisurely left-hand turn onto the thoroughfare from a side street. She screamed and slammed on the brakes. The SUV began to skid sideways, her rear bumper making contact with one of the cars waiting in line next to them, sending her vehicle spinning in the opposite direction. Delaney’s cries rang in her ears. Images blurred through the windshield, a tree, a lamp post, and then, the car gunning for them. With a tremendous crash of metal it drove the SUV into a park bench and a concrete garbage can. The airbags failed to employ. Her head hit the steering wheel with the initial impact, and then the side window when the SUV crumpled against the trash can. A car horn blared, her car horn. She struggled to lift her head. About ten feet in front of them, the black sedan swam in and out of her vision. Its front bumper trailed on the ground on one side, half of the hood accordioned upward, steam rolling out of it menacingly in the cold night air. She imagined the black vehicle to be some sort of fire-breathing dragon. Why does it want me dead? she asked herself groggily. It came to life in front of her eyes, backing up over the curb a few feet, pieces clunking and scraping against the concrete. The wheels turned and with a screech of spinning tires it scrambled toward her. For a minute, she thought it sought to finish them off. Instead, the sedan roared off into the night with sparks flying from its underbelly. Pardoned for the moment, she became aware of the pain driving through her brain. She clutched at her stomach. She tasted blood. Head heavy, she laid it down on the steering wheel, closing her eyes. She heard the horn again…shouting… somewhere, Christmas music. Delaney! a voice screamed in her head. She heard a strange noise, a loud, screeching, whirring noise…the dragon returning. She whimpered and went still. Thanks for reading! Now, as an added bonus, give me a few of your holiday favorites in the comments (favorite foods, favorite activities, so on) and you’ll be entered to win a copy of my romantic suspense BETWEEN ROCK AND A HARD PLACE. Giveaway ends 11:59pm EST November 14th. Please supply your email in the post. You may use spaces or full text for security. (ex. jsmith at gmail dot com) If you do not wish to supply your email, or have trouble posting, please email maureen@justromanticsuspense.com with a subject title of JRS GIVEAWAY to be entered in the current giveaway. Good morning! Thanks for having me on this morning! The post looks great! My Christmas roll continues. I am finishing up invitations to our annual Christmas party and have already picked up some gifts. Let the festivities begin, I say...right after Thanksgiving. Love baking cookies with my daughters. It's a tradition of ours. Love Christmas music and movies and of course, romantic Christmas stories to read! All of those things are right up my alley, too. I've already got a few of my cookies picked out. Can't wait to start! thanks for participating, Debbie! I see I've found some kindred spirits here! :) I can't do Christmas music until Black Friday. Just a thing I have. But I love it. I have a dozen albums and I like to sing along. I usually like to watch The Grinch for my first movie, and I have to be obnoxious and say the lines along with the narrator. Dr. Seuss outdid himself on that one! Thanks for joining in on our discussion, Colleen! I love decorating the tree and house for Christmas - both inside and out. Yes I decorate some outside trees too and not just with lights. I wrap some large empty boxes to put under them to complete the look. Love this! It's great when we keep that joy in our hearts year after year! I decorate almost every surface inside, taking down pictures and replacing them with Christmas pictures, and then sticking a bow or greenery behind them. I really do almost go overboard, but I enjoy it and it's not really hurting anyone so I guess it's not that bad a thing... I hope your holidays are lovely, Jo-Anne and thank you for joining us! Apple pie at Christmas? Interesting... Thanks for sharing! Buying gifts can be a lot of fun, except when you're stuck and can't figure out what to get someone. We love to make a big production out of decorating the tree. Although now that the kids are older, they aren't quite as enthusiastic as in yesteryears! ;) Thanks for joining us, Mary! Oh, I love Christmas! I have been listening to Christmas songs since Halloween. :) And reading Christmas books. One of my favorite activities is putting the tree up with my kids. My traditional Christmas is listening to music and going to see Christmas lighting decorations. I'm also in to the habit of reading Christmas stories and watching Christmas shows and movies. My favorite part of Christmas is spending time with family. They are all grown and have homes of their own, so time is a special gift.